Duolingo has revolutionized the way that people learn languages, and is leading the world in free education. In fact, Duolingo’s promise is: Learn a language for free. Forever, a wonderful and altruistic mission. For this reason, millions are turning to Duolingo for their language learning needs. Leading this are people, probably like you, with an urgent need to learn English to advance professionally and be successful, but who do not have the means to pay for expensive classes or courses. Unfortunately however, it’s unlikely that depending solely on Duolingo will bring you to a level of fluency or professional competence in the language. Even if you take the time to complete the entire course, without some supplementary resources, you probably won’t be prepared for a job interview or even a spontaneous conversation. It’s easy to fall into the trap of depending on just one learning resource, like classes or an app like Duolingo, especially when it’s so convenient. However, if you don’t proactively search for opportunities to use the language in your daily life, real fluency will always be just a dream. That’s why I decided to bring you a definitive guide of resources to supplement your learning with Duolingo, so you can make learning English fun, effective, and permanent. Duolingo is great as a free resource, but as I said above, it is limited if your goal is fluency. A respected polyglot recently commented on Facebook that Duolingo is great for playing with the language, but if you TRULY want to learn the language, she wouldn’t recommend it. Her opinion is that if your goal is fluency, get immersed in the language. This doesn’t mean to discard Duolingo all together as a resource. If you enjoy it, keep at it; having fun is the most important part of learning. Duolingo can teach you vocabulary and basic structures to put it to use. As you progress, you will learn more advanced vocabulary and some basic grammatical functions. I’ll divide Duolingo’s exercises into three categories: Translation, listening and writing, and pronunciation. I will describe what each is lacking. In general, being overly dependent on translation when learning another language is a bad idea. It can be helpful to provide understanding in the beginning, but thereafter will become a barrier to fluency. First, if you are relying on translating, which you will be if you’re only using Duolingo, you’re always going to connect English to your native language. Translation slows the process of starting to think in the target language, which is crucial for fluency. If you’re always translating, conversation will be difficult, because you’ll have to think first in your native language, then translate it to English, then say it. Unless you have a patient conversation partner, this will be frustrating. Second, translation over-simplifies structure and grammar. These aspects of the language—like syntax, conjugation, preposition use, etc.—usually can’t be translated, and trying to learn them this way can make these already complex parts of the language even more confusing. Sure, you’ll be able to do Duolingo’s translation exercises correctly and advance in the course, but in real world use, you will still be confused of how to use these structures correctly, and will likely make a lot of mistakes. Plus, it will certainly be more work to stop translating in your head and start thinking in the target language at a later time than if you had made efforts to think in the target language in the beginning. If you want to learn with Duolingo, the solution to not always translate in your head is to also learn how the language is used in context, for example by reading or watching TV shows, but we’ll discuss more of that in the second half of this article. In one of Duolingo’s best exercises, you have to listen and transcribe what you’re hearing. However, this uses a sort of recorded or robotic voice, which doesn’t prepare you for the reality of how natives naturally speak or to participate in conversation. Natives cut, morph, and link words when speaking, and this is something you don’t want to ignore, even as a beginner. In order to compensate for this, you should surround yourself with the language by listening to the radio, podcasts, shows and movies. The last aspect that Duolingo addresses is pronunciation with some exercises in which you say something in the target language and the system analyzes if you’ve said it correctly. However, this is imperfect for the similar reasons to the listening. 1) You should learn, at least minimally, how natives actually link and pronounce certain common collocations, and 2) the technology isn’t precise enough to recognize if your pronunciation is actually good and understandable as a real person would. I’ve seen friends using Duolingo’s pronunciation in languages I speak like English and Spanish, and they were able to pass the pronunciation activities even with terrible pronunciation. The remedy? Start speaking and get feedback from a real person. The minimal standard by which you should grade your English is that someone can understand you. 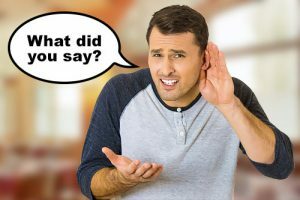 If you can’t afford a teacher, we also have various exercises you can try to make sure you really have correct pronunciation. Before we move on to the tools that can make your learning with Duolingo effective, I want to point out a few more negative aspects that you should be aware of. 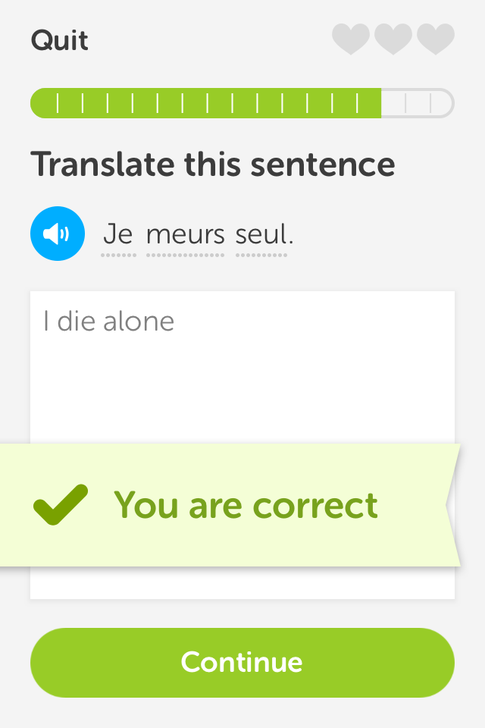 Duolingo automatically creates sentences with the vocabulary and structures you already know and are learning. However, this can often result in strange, useless examples that you will (hopefully) never encounter in real life. 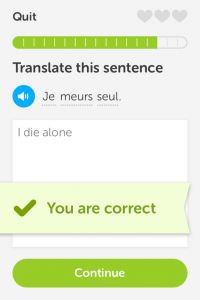 When I first started learning French, I used Duolingo. One example I will never forget because of its oddness was, “I die alone.” Luckily, I haven’t had to use this one. Another example was when Chad was learning Spanish, it taught him, “The spider eats bread.” Not very practical for his daily life in Chile. Duolingo is working to improve their lessons, so hopefully we’ll be seeing better examples. Another downside is that Duolingo doesn’t focus on the core vocabulary that you need to get to a conversational level quickly. What one can learn in a certain amount of time is obviously limited, so if your goal were to get fluent as quickly as possible, then you should learn the vocabulary that you’ll need most in daily conversation first. Things that you can use to talk about yourself, what you do for a living, your hobbies, questions you might ask new people, etc. Duolingo teaches vocabulary in topic-centered lessons (much like a textbook). And much of this vocabulary is not useful for the average person on a daily basis (for example animals, clothing, rooms in the house, etc.). If fluency is the goal, then the vocabulary you learn, especially in the beginning, should be highly personalized so that you can begin speaking as soon as possible <LINK>. The reason why most quit Duolingo is because after a while the lessons can become repetitive, predictable, and unengaging. Keep in mind, this is bound to happen with any resource if you don’t keep your learning interesting and challenging. Integrating some of the resources in the next section into your learning will definitely keep it more fun and engaging. With what we now clearly see Duolingo is lacking, how can we continue making this free tool work for us on our journey to fluency? Something I recommend all of my students try is keeping a daily journal. Every morning, for just 5-10 minutes, sit down and write in English. It can be about anything. Some ideas are: Whatever is on your mind, the previous day, your plans for the day, goals and dreams, a story, etc. The important thing is that you make a daily habit. Mistakes are ok! Even if your writing isn’t 100% correct, you’re immersing yourself in the language for a few minutes every day while applying what you’re learning on Duolingo. Want to take your learning even further? Check out Lang-8, a website where you can get your writing corrected by native speakers in exchange for correcting theirs. Also, learn more about how to improve your writing and reading in English. You surely listen to music in English already, but do you use if for your learning? Music is my favorite tool for language learning! If used correctly, it’s great for listening, learning new vocabulary and grammar in context, and for improving pronunciation and assimilating the rhythm and flow of the language. You’ll surely start to recognize some of what you’ve learned in Duolingo. See how I use music for learning here and if you want to use it to improve your pronunciation, check out this method. This is a way to experience more natural, conversational English than with music, and with the right method it can be extremely effective to improve your comprehension, with more everyday English than Duolingo. We especially recommend TV shows because it’s easy to get addicted to them and they are short enough to watch every day. Plus, they capture the culture and language used by native speakers. You might be surprised by how much you understand just through the context, especially if you challenge yourself. Learn more about learning with TV shows here. If you like YouTube videos, we’ve got a list of great ones for English learners here. You can also find some terrific ESL videos on YouTube to help you improve your pronunciation, vocabulary, etc. Let me tell you a little secret. Are you ready? The best way to get better at speaking, is by SPEAKING! Learning and practicing English with Duolingo, music, and TV shows is great. But if you really want to get fluent eventually you’re going to have to open your mouth and try! Being shy is no excuse, here’s why. There are ways you can do this on your own, like speaking to yourself (when you’re alone) and even recording your self and listening for mistakes. It’s also important to practice with other people though. This can be friends, like other people in your English class. You might even be able to meet English speakers in your city. We created our new website, RealLife Global (RLG), to give English learners all over the world the opportunity to really use what they’re learning. RLG will help you to build your confidence by actually using the language. Each conversation is just 3-minutes, so if you’re shy it is over quickly and you can talk to someone new. It’s a really great way to start practicing and improve your English speaking in a supportive community, so log in and try it now. Should I learn with Duolingo? With everything I’ve said in this article, you may ask yourself if you should learn with Duolingo. 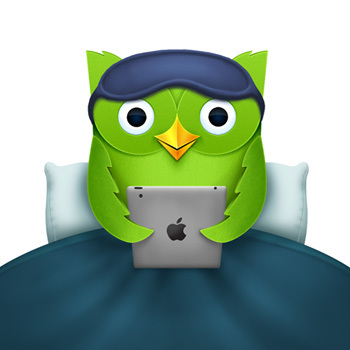 Duolingo is far from perfect, but it’s improving all the time, and it will always be free. What it’s lacking makes it comparable to traditional classes, which if you rely on completely you will also probably never be fluent. Furthermore, from my experience in schools in other countries, I know that oftentimes teachers are unqualified, just one lesson ahead of their students, and can’t provide the immersion that is needed to gain fluency. In summary, don’t depend on any one thing to make you fluent. Like a child, you should play with the language and have fun. Everyone learns differently, and the best language learners are constantly experimenting to find what works best for them. Duolingo is a great resource for gaining some basic structure in the language, and it’s great to recommend to friends or family who are just getting started. But as much as possible, find ways to build daily habits that you enjoy in English. As we always say, don’t just learn English, live it! What do you think about Duolingo? I’d love to hear your opinions in the comments! Great article Ethan. I think Duolingo is a great tool for beginners, but it is not enough to reach an advanced level. What annoys me the most is the translation dependency. I wish they did not ask our first language, and tried to teach English using other mechanism such as images and meaning of words in English itself. Translation is never a good thing for your learning. When you translate too much, you are not able to think on that target language. Also, languages are not totally translatable. English has many expressions that cannot be translated to any language. Very helpful advice not only on learning English, but other languages too. Thanks. Thanks Kathryn 🙂 That’s great to hear. I started learning spanish by using duolingo. I’d say that I learned just few things, it just provides basic words and sentences. Even though it helps in the beginning I would recommend audio books for sure. It makes the learning process faster, exciting and also effective.